﻿Loyal Companions Crematory services are by appointment only. Please call us at 812-686-5179. ​Please leave a message if no answer. Please be sure to be in contact with someone so they know that you are coming. ​We are by appointment only because we do have day jobs that don't allow us to be available at all times. If you do not hear from us in a reasonable time, please call 812-431-5498. *If you call after hours and we do not answer, please leave a detail message and we will return your call as soon as we can. We feel your veterinarian is a major part of your family. We work along with them to help make this event as smooth as possible. We service most veterinarians in the Southern Indiana area. Please call your veterinary clinic to see if they already use our services. If they do not, then please call us and we will help you make arrangements for us to pick them up. If they do offer cremation services, make sure to ask them where they will be going. Some local veterinary clinics use other services located in Louisville and Indianapolis. Make sure you request us specifically. If your veterinary clinic doesn't use our services, please fill out this form to allow us to get permission to pick up your loyal companion. Private Cremation is where your loyal companion is the only one placed in the crematory. This is our most popular service. The cremains (ashes) are returned to their family. Cremains are returned in a temporary urn if one is not chosen. 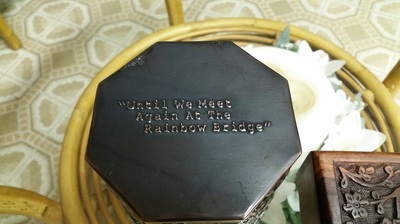 ​Chose from our urn selection below. ​We do not offer multi- pet private cremation with return unless it is requested and the pets are from the same family. Private Cremation is on a first come, first serve basis. So depending on the demand at the time of your pet's passing, depends on the turn around. We like to have pets ready to go home with in a week of receiving them at our facility. Once they are ready to go home, we will call to make an appointment for pick up. If we pick up at a veterinary clinic, we will drop them off at the veterinary clinic, unless other arrangements have been made. The veterinary clinic will call to let you know. Communal Cremation is a service we offer for those that do not want the cremains returned. 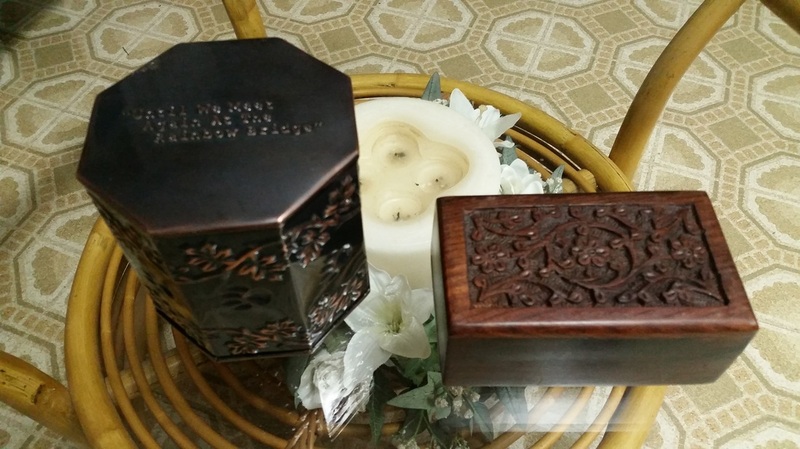 These cremains are not returned to the owners. These loyal companions are cremated then their cremains are spread over our beautiful fields on our family farm. ​You can see the field in the very top picture with the sunset. -Pick up of your pet during business hours and within 30 mile radius of our facility. ​We do pick up in Evansville and Newburgh, Boonville veterinary clinics. -Pet's cremations are placed in a complimentary (temporary) urn of your choice. See below for urn selection. *Prices are subject to change anytime. All payments due before service is rendered or products ordered. All sales and services are final. We take cash, checks and credit cards(small fee may apply). We have several urns that are kept in stock. We also have a urn distributor that we work with. You can choose for this catalog on this link. Click here ---> Forever Pets Urns ordered take about 7 business days to receive. If you do not see what you like, feel free to order from online and you can have the urn drop shipped to us. We will place them in that urn at no extra charge. The pictures below are what we keep in stock for complimentary urns. These items are Free with the cremation. 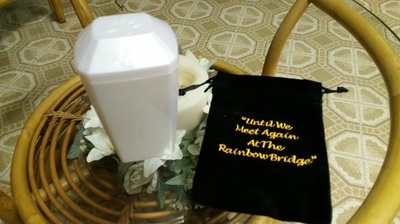 You can choose the plastic opal urn with paw print or a velvet bag with "Until We Meet Again At Rainbow Bridge." ​You will also receive a Certificate of Cremation. The urns pictured below can be purchased at an additional charge. Prices range from $10.00 to $30.00, depending on the weight of the pet. Your can choose between the Rainbow Bridge tin urn or the wooden decorative urn. These urns are kept on hand since they are high in demand. 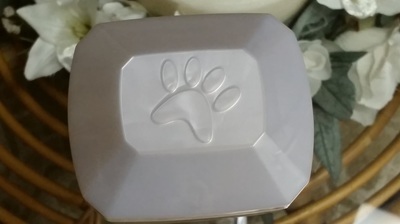 We also offer Clay Paw Prints for additional $18.00. You can also request clips of hair at no additional charge. You can request a photo frame to be attach to the urns so you can put your favorite photo of your loyal companion. All sizes are $7.00 each. Here is another way that you can memorialize your beloved loyal companions. I have met Lynee and she has personally made the cremains art below with cremains of my beloved pets, Lucy and Chase. Lynee takes this amazing gift seriously! You can see in the pictures below. You can also visit her website to learn more about her and her gift! Go to www.BlissGlass.com. She also has a Facebook page! It this is something that you are interested in having done for your loved one, please let me know and I will start the process of contacting Lynee and getting the cremains to her. The cremains are located in the round circles on Lucy (dog) and Chase (cat). On the feathers, the cremains are located in the tip.